In a recent visit to my local secondhand bookshop I stumbled across a collection of Stig Dagerman’s short fiction, The Games of Night (Quartet Encounters, 1986). 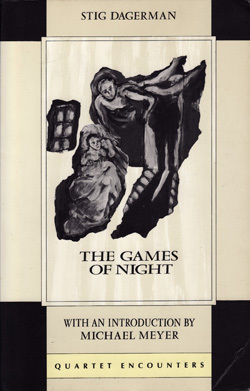 The title story, The Games of Night (Swedish title: Nattens Lekar), deals with themes of alcoholism and child neglect and brims to overflowing with the emotive constructions Greene describes. Ake, the child narrator, lies alone at night, dreaming of and playing with ways he might bring his father home from the pubs and bars in which he spends his nights and all his wages. The child’s imagination carries him to his father’s side as if astral projecting and Ake leads his father to taxis and trolley buses in the hope his father will make it home and his mother will stop crying. When such efforts fail the boy, in his imagination at least, resorts to violence. It is a simultaneously chilling and tender portrayal of a child lost in the disintegration of a marriage. An all too real tale of domestic problems with a unique and clever dash of magical realism thrown in. Dan Levy Dagerman’s (a relation of the author?) short film adaptation of The Games of Night captures the essence of the story. I particularly like how the filmmaker deals with the problem of showing Ake’s ‘traveling’ through the night to arrive with his father. If, like me, you hadn’t heard of Stig Dagerman before, I would recommend your seeking out this collection. He’s an author I can’t believe I haven’t stumbled across earlier in my reading life. And while we’re on the subject, who was the last author you ‘discovered’ by happy accident? And for anyone wondering how I got to buy this when I am currently ten months into a twelve month stint of buying no books, I was given special permission because the book is out of print and only cost €2. Bargain and result.